It started on the NYC tabloids front from the moment pitcher Bartolo Colon signed with the Mets. As NBC Sports Hardball Talk writer Craig Calcaterra noted, the Post went with “Get a Load of This” [groan] while the News opted for “Fat Citi” [double groan]. Instead of a jubilant clubhouse with loud music and happy players after Friday’s walk-off win, the doors opened to silence, empty, spinning chairs and no Mets. 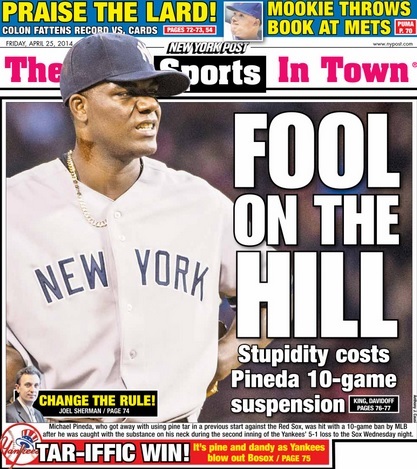 Apparently angry about an article in the New York Post on Friday about Colon under the headline “LARDBALL,” the players would not talk to the media until Post writer Mike Puma left the clubhouse. Puma was asked to leave and did so without incident. Within a minute, several Mets appeared in the clubhouse. The team would not comment on the incident. The online version of Puma’s article does not feature the derogatory term in the headline. Meanwhile, Puma did not do himself any favors Thursday on Twitter; the second tweet below is a condensed version of the lede from his contentious Colon piece.